The CGI heavy film directed by Alex Royas and written by Matt Sazama and Burk Sharpless is filled with a competent and famous cast, but is definitely an entry into the WTF genre. There is nothing here grounded in reality. It's a video game run amok with stuff seen in other fantasy films. It's a visual treat, and you truly can expect the unexpected. 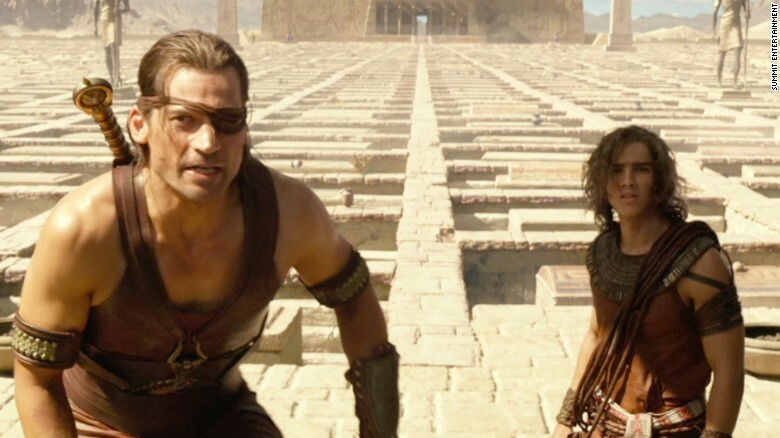 The film did receive some backlash for it's predominately Caucasian cast of Egyptian characters for which the director and Lionsgate apologized. It was still made. In this world of gods ruling ancient Egypt, King Osiris (Bryan Brown) is set to crown his son Horus, god of Wind (Nikolaj Costner-Waldau) at a huge ceremony sort of like those old cast of thousands movies complete with painted backdrops. The beloved King was set upon the throne by his father the Sun god Ra (Geoffrey Rush). 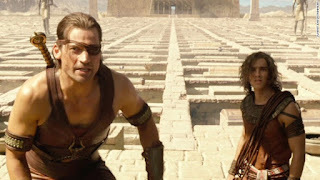 Osiris's brother Set (Gerard Butler) was sent away from the kingdom and riches and of course harbors a power jealousy. So he usurps the crowning by killing everyone who disagrees. Gods apparently can be killed, even though they are giant compared to their human subjects and their blood is gold. They can also transform into gold plated warriors, some with wings. Set steals Horus's eyes that hold special powers and takes over the country by enslaving the populace and denying their entry into the eternal afterlife if they cannot pay. Zaya (Courtney Eaton) is a Horus fan and encourages Bek (Brenton Thwaites) to break into the trap filled vault to get the eyes and give them to the Horus who is holed up in his parents tomb feeling sorry for himself. Bek being an ingenious thief manages to elude the horrific booby traps, but there is only one eye. Zaya is caught giving the plans from the builder master Urshu (Rufus Sewell) and is shot with an arrow. Bek begs Horus to help him bring her back to life, since he's a god in exchange he can get the other eye. Horus does not have all the power he needs with just one eye, so he asks his grandfather Ra for help and gets the power back long enough to go to him. Up in space, in a sort of spaceship, which is tethered to the sun and battles a space worm that is constantly threatening to eat up earth. (Phew!). Bek and Horus set off on their quest to destroy Uncle Set's power which is underground. If they pour the water of creation into it, Set will be destroyed. They are aided by Set's Queen Hathor, goddess of love, and Horus's lover before she married Set to save her life and that of Horus. They also need the help of the god of wisdom, Thoth (Chadwick Boseman who is wonderfully campy) to answer the riddle of the Spinx. They cross deserts and fight monsters while Bek and Horus develop a friendship despite their differences. It's a never ending series of crisis with love conquering all, of course. Despite the whole weirdness of this universe, it will offer an afternoon of silly mindless entertainment that is quickly forgotten.